A new French black metal band from Bordeaux has just released its debut full-length album. After the split-up of the band Black Storm, three of its members decided to form Strynn in 2011. The band consists of Anadrark in guitars & vocals, Dwimorberg in guitars & vocals too and Obscurisis in drums. On April 2012 they released their first work, a split album with Galvauder (experimental black metal from France) limited to only 100 copies. One year later, on April 15th 2013, their debut full-length album “Decadence” is co-released by Le Crépuscule du Soir and Mortis Humanae productions. 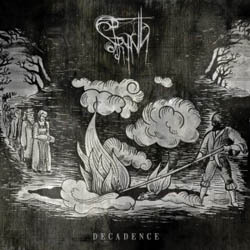 Strynn offer us cold and dark old school black metal and they are very good at it. The absence of bass guitars in their music is an unusual choice, but it affects their sound in very interesting way and totally works for them. As a result their music is based completely on the guitars and the combination of male (Anadrark) and female (Dwimorberg) growling vocals. They move from mid to fast tempo, having a great variety of guitar riffs, finding the right balance between aggression and melody and most importantly avoiding repetition. They use exclusively screaming vocals and I find it hard to tell who sings what, since both have similar “venomous” sharp vocals, expressing perfectly the pain, despair, hatred and distress of their lyrics. They chose to complete each other as one singer, instead of making a dialogue between brutal male and clean female vocals. “Decadence” was recorded and mixed at Echoes Studio by Raphael Henry and their sound is very clear with a very good production. This genre doesn’t leave much space for originality, so the only question is the quality of the music itself. And I must say that Strynn have composed 11 great songs and over 43 minutes of raw yet melodic black metal. It is a more than decent debut album, recommended to all fans of the genre. “Decadence” is released by Le Crépuscule du Soir and Mortis Humanae Productions in a limited to 500 copies digipak edition with the beautiful cover artwork by Rachel MKong, perfectly matching with the album’s atmosphere. For more info and music samples you can visit their official pages in the links below.